Meetings Plan: If you plan to transfer files, make sure the host of the meeting Starts the Meeting with "Give Full Control" checkbox checked(default). Access Home or Office PC: Enabled by default. Once the Viewer has connected, the Viewer will see this tool bar, look for the circled icon on top. ShowMyPC Shared Storage provides you with a way to share files between different users or computers. You can transfer files between a Windows, Mac and Linux using this browser based shared folder system. 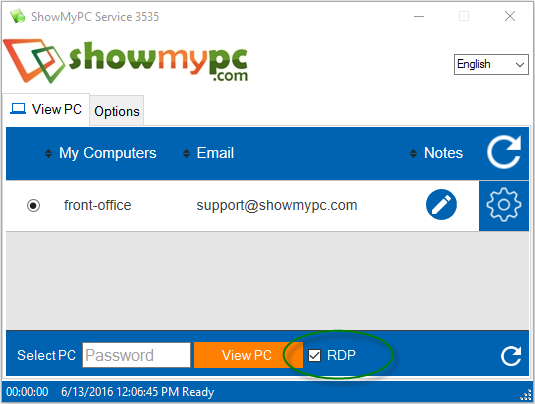 How to transfer files using ShowMyPC Windows Remote Desktop? This method applies to you only if you are using ShowMyPC "Access Home or Office PC service"
1) Start and Run your Viewer. 2) Select the PC, and check the Checkbox "RDP"
3) Once you are connected you should see your local drives, in you remote PC's My Computer list. You may copy and paste file as if it was a local drive. 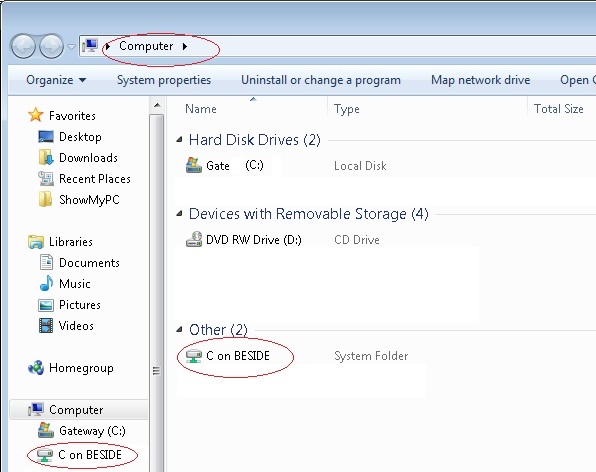 If you do not see your local drive under My Computer, close any open My Computer windows and follow one time setup below. If you do not see the your local drives in the remote pc. 1) Follow the above steps to make a Remote Desktop Connection. 2) After you see your Remote Desktop, close the newly opened Remote Desktop Window only, leave ShowMyPC window on. 3) Open Start > Run and type mstsc. Do not change computer or port name shown. 4) Now click on options and again click on Local Resources Tab. 6) Check the Checkbox "drives" in the newly opened window in vista or check the checkbox Local Drives in Windows XP. 7) Click OK and connect to the remote computer now. This time you will be able to see your local drive under the Remote PC's My Computer window. This is a one time setup, but some PCs may not save these settings, so they have to be redone (We are in process of fixing this).